In 1979, I was just discovering Heavy Metal in a big way. Usually, this involved one of my friends lending me their latest discovery (I was still at school and always short of cash). So The Scorpions, Van Halen, Aerosmith and Judas Priest circa ‘Killing Machine/British Steel’ were never far from my Ferguson Music Centre. Said stereo might not have been up to the hi-fi spec of today but if you turned it up loud enough... Priest had at this point in time developed the knack of penning hit singles so they’d turn up on BBC TV via Top of the Pops which was essential viewing back in the day, it was so cool to actually see Metal bands on TV. By 1983 I was lucky enough to catch a stunning show as Priest played the Hammersmith Odeon. This scenario would be repeated in the late 80’s with another great show and more great memories. My tastes might have changed over the years but I’ll still happily reach for a Priest album on occasion, with ‘Screaming’ probably my favourite, so I was very keen to read what K.K. Downing had to say about his ‘Heavy Duty’ time in the band. In the early chapters of ‘Heavy Duty’ Downing does a fine job of recalling his difficult early days growing up in the West Midlands. His relationship with his hypochondriac/OCD/gambling-addicted father would probably be looked at in a totally different light by the authorities now. England in the late 50’s/early 60’s might seem almost Dickensian to many readers with scenes of three kids sharing a bed and a reliance on state benefits, but this was a reality for many. To put the time and place into some kind of perspective; Rationing didn’t end until 1954, there was a stigma attached to “free school meals” and my grandparents still had an outside toilet in the 70’s. Downing would put these early problems behind him with the discovery of some bloke who went by the name of Jimi Hendrix. Downing in his early guitar days was a great believer that if you wanted to get better you had to work at it, which is refreshing as so many guitarists seem to claim that work wasn’t required to become an overnight shredding sensation (very frustrating for a budding guitar hero fumbling through a Bert Weedon book). Natural talent can only take you so far and Downing gives a little insight into his work ethic which is food for thought for us fretboard fumblers. The early days in Judas Priest are recounted with a relaxed style ideal for tales of numerous small gigs up and down the country, often it seems sharing a stage with Welsh rockers Budgie while sleeping on many a hard floor as band members came and went. The fact a young Downing failed the audition for the “original” Judas Priest line-up is made even more amusing by the return of the name a year or two later as singer Al Atkins effectively re-joined his own band. By the time the hard-working, but very broke, band signed a deal with the Gull record label young singer Rob Halford was out front. Glenn Tipton joined the band soon after and Downing is refreshingly open about the relationship between the two guitarists (a relationship that would play a considerable role in Downing eventual departure from the band). While early financial issues and the recording of the Gull albums are also tackled with a relaxed water-under-the-bridge approach due to the passing of time. While remembering the ‘Stained Class’ era Downing discusses the distribution of the workload between the two guitarists which I found interesting. Back in the day my friends and I were of the opinion that Glenn played all the fast tricky stuff and K.K. was the dive-bombing, Wang bar wielder when it came down to solos and the like – we were obviously over-simplifying things. Downing’s recollections of recording the albums and the bands rise, including their incredible success in the USA, are fleeting but not without the odd story or three (his relationship with Glenn seemed to work best on the golf course…). Which is fine as this is Downing’s memoir, if you want technical recollections of the album recording process they’re books and articles a plenty you can track down. It’s good to see a mention of Priest’s trip to Paris to record with the Stock Aitken Waterman team and something of a shame that the recordings from those sessions didn’t pop up on one of the recent deluxe reissues (It was probably a step too far at the time but surely after all these years…). His thoughts on the many bands they shared stages with, from young upstarts like Iron Maiden and Def Leppard to such giants as AC/DC and Led Zeppelin, make for an interesting read. Downing also takes a good look at the 1990 court case regarding subliminal messages on albums, without getting mired in the legalities and is honest about why he feels the case ended up in court. Rob Halford’s departure and solo career are also honestly recounted with Downing split between his love for ‘Jugulator’ and disdain for ‘Demolition’ during the Tim ‘Ripper’ Owens years. It’s good to hear he still has a good relationship with Owens because the reformation with Halford was an inevitability. 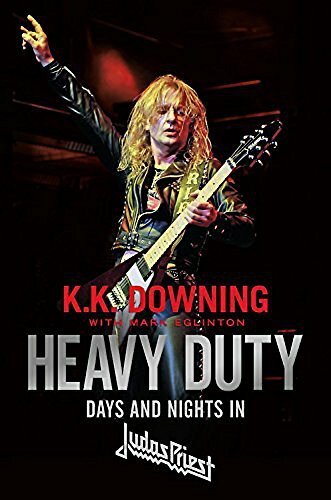 ‘Heavy Duty’ is an interesting read, written in a relaxed conversational style that speeds through the career of this classic metal band. Downing’s thoughts on his time in Judas Priest will probably divide fans and start many a debate which isnt a bad thing. Looking back, I’m pretty sure that he wished he’d stood his ground more often but human nature is what it is and hindsight is 20/20. Heavy Duty: Days and Nights in Judas Priest by K.K. Downing with Mark Eglinton is available now via Da Capo Press.